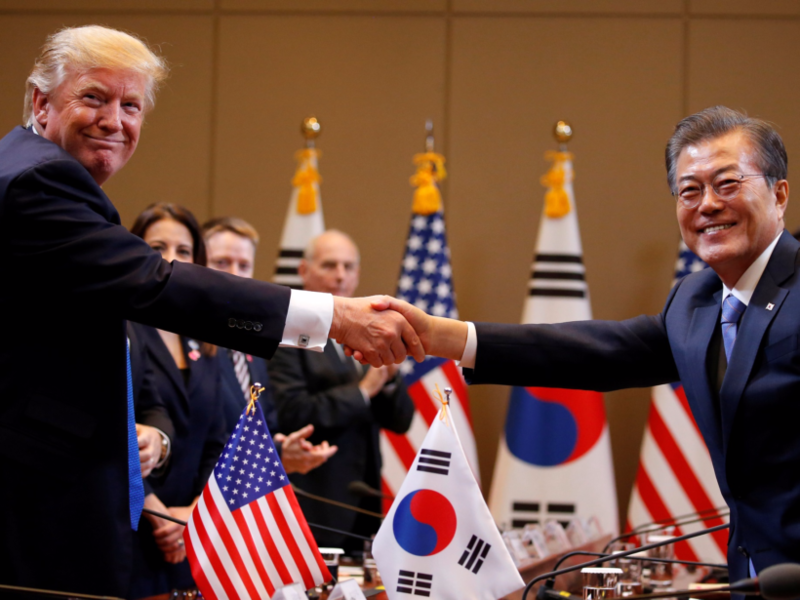 U.S. President Donald Trump and South Korea’s President Moon Jae-in shake hands during a meeting at South Korea’s presidential Blue House in Seoul, South Korea, November 7, 2017. 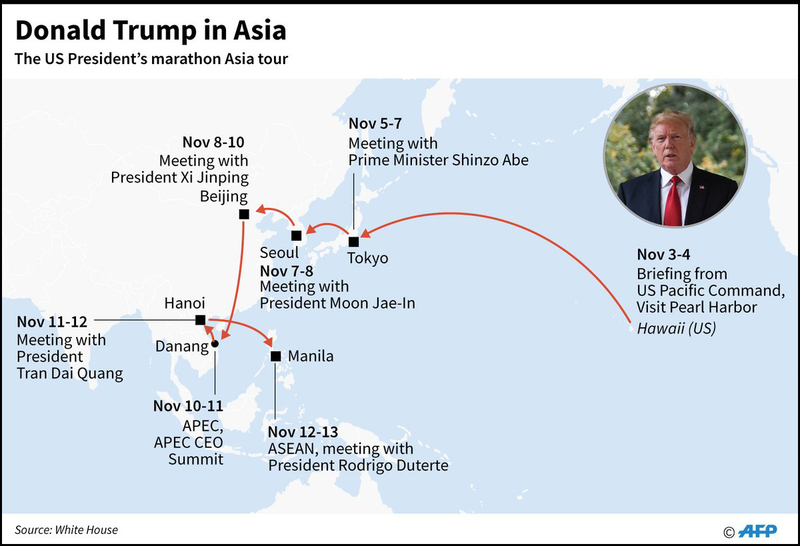 (Alayna Treene, Axios .com, Nov. 3) – President Trump depart[ed] on the longest trip of his presidency [on Nov. 3]: a five-country, 12-day tour of Asia intended to strengthen international resolve to denuclearize North Korea, promote a free and open Indo-Pacific region, and advance economic partnerships through fair trade. President Trump’s underlying goal is to publicly reaffirm his commitment to the region and flex America’s muscles in regard to the country’s global influence. Nov. 3: In Hawaii, the president received a briefing from the U.S. Pacific Command, and visited Pearl Harbor and the USS Arizona Memorial. President Trump arrived in Japan Nov. 5. where he had several meetings focused on promoting a free and open Indo-Pacific region. The president later spoke to American and Japanese service members at Yokota Air Force Base, before joining Prime Minister Shinzo Abe for a round of afternoon golf. President Trump also had a state call with the Japanese imperial family, and then participated in a day of bilateral meetings with Prime Minister Abe. Abe then hosted a meeting for Mr. Trump with families of Japanese citizens abducted by the North Korea regime. On the evening of November 6, Abe hosted a banquet for President Trump and the traveling delegation. On November 7, Mr. Trump traveled to South Korea (formally ‘the Republic of Korea’) on November 7, where he met with American and South Korean service members at Camp Humphreys before participating in bilateral meetings with President Moon Jae-In and attended a state dinner that evening. 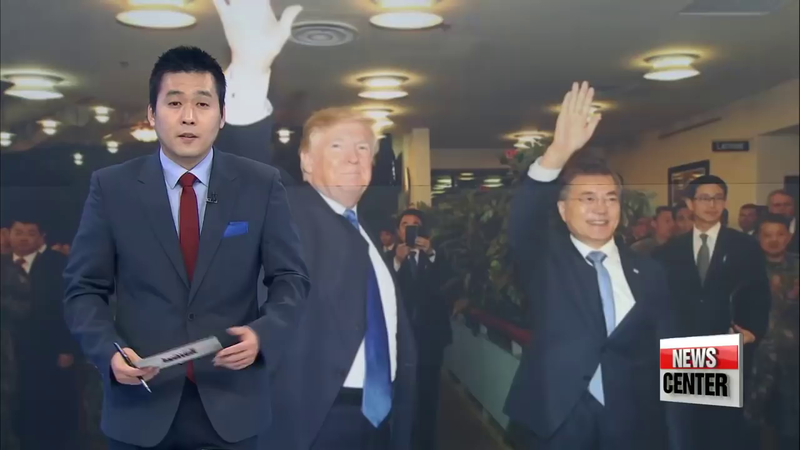 On November 8, President Trump spoke at the South Korean National Assembly, where he celebrated the alliance between the U.S. and South Korea, and called on the international community to join in maximizing pressure on North Korea. The president later visited the national cemetery in Seoul to pay his respects to fallen U.S. service members. 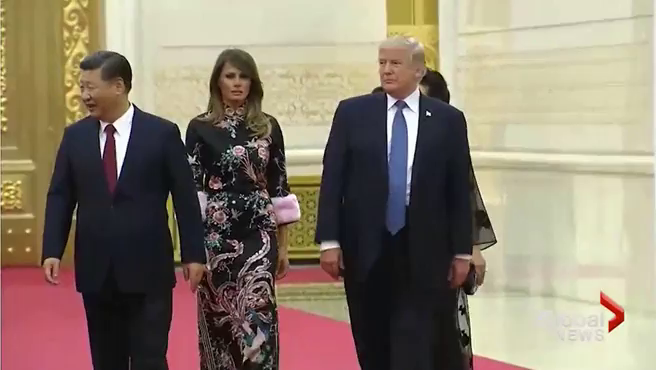 Mr. Trump traveled to Beijing for a state visit on Nov. 8 where he participated in series of bilateral commercial and cultural events, including meetings with President Xi Jinping. President Trump’s aim was to secure China’s commitments to exert more pressure on North Korea and to rebalance U.S.-China economic relations. A CEO delegation convened by Secretary of Commerce Wilbur Ross was present. Overall goal: To send a clear message that for bilateral economic relations to be sustainable over the long-term, China must provide fair and reciprocal treatment to U.S. firms and cease predatory trade and investment practices. On November 19, President Trump traveled to Da Nang, Vietnam, where he participated in the Asia-Pacific Economic Cooperation (APEC) meeting and delivered a speech at the APEC CEO summit. (Note: APEC is a free trade forum for 21 Pacific Rim economies). Goal of APEC speech: Reinforce the U.S. commitment to an equitable, sustainable, and rules-based international economic system based on market principles. On November 11, Mr. Trump traveled to Hanoi for a state visit and bilateral engagements with president Trần Đại Quang and other senior Vietnamese leaders. This was Trump’s second meeting with Vietnamese leadership following Prime Minister Nguyễn Xuân Phúc’s White House visit in May. President Trump arrived in Manila on Nov. 12 to participate in the special gala celebration for the 50th anniversary of the Association of Southeast Asian Nations (ASEAN). On November 13, he celebrated the 40th anniversary of U.S.-ASEAN relations at the association’s summit, and participated in bilateral meetings with Philippine President Rodrigo Duterte. Goal at ASEAN summit: Advance US leadership in promoting an Indo-Pacific trade and security architecture based on freedom, openness, and adherence to rule of law. President Trump last-minute added an extra day onto his already long trip to attend the East Asia Summit, a major forum for political and economic cooperation among 18 member countries. His [decision to attend] signaled a high level of U.S. engagement in Asia-Pacific. 1. What is the population of ASIA? b) Name the 5 countries President Trump visited on his trip to Asia. c) What were the overall goals of the President’s trip? 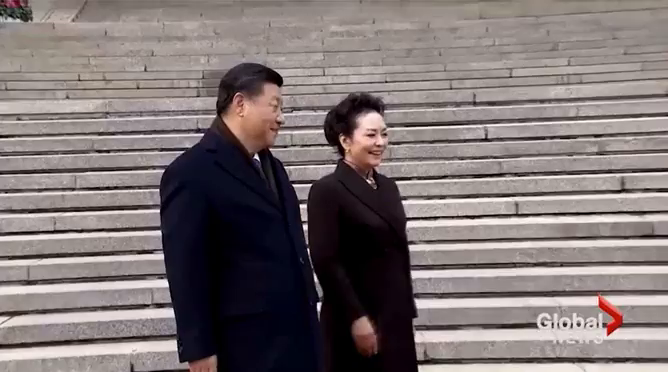 d) How did the leaders in each country treat President Trump? What is your impression? Indeed, many Beijing residents told McClatchy that they hope Trump will persuade China President Xi Jinping to move more aggressively on the nuclear threat next-door and stop relying solely on negotiations. Professor Hu even suggested the U.S. should abolish North Korea’s nuclear missile facilities or launch a pre-emptive strike against the rogue nation. Danny Yang, who is studying at Beijing Foreign Studies University, described Trump’s language as dramatic but said she was more than comfortable with it. “It’s necessary,” she said.